The world of sapphires is so extensive that a glossary full of useful terms and concepts becomes very useful to help make all of the information make sense. There are many useful terms that help to better understand sapphires: how they have been used in jewelry and culture, the specifics to cutting, how they are formed in the earth, and much more. 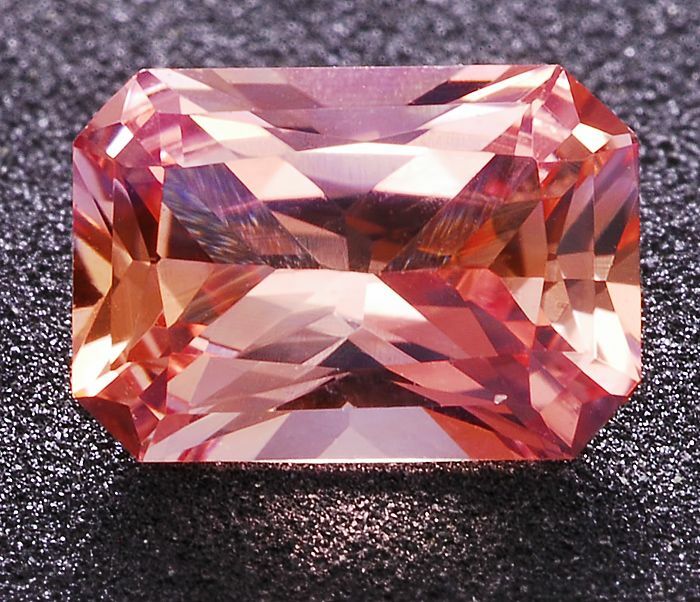 This glossary features an extensive listing of terms related to sapphires, and will help to provide context and further information about everything that has been presented on our Sapphire Education pages. 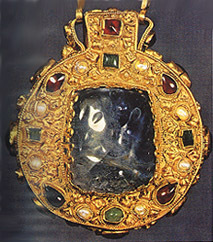 The sapphire amulet of Charlemagne. Alluvial deposits: loose, unconsolidated soil or sediments that have been eroded, reshaped by water, and deposited in non-marine setting. Amulet: an ornament or small piece of jewelry thought to give protection against evil, danger, or disease. 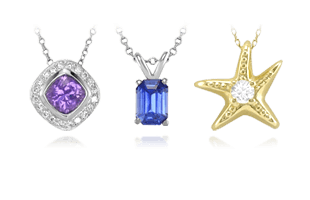 Asterism: the phenomenon of a gemstone exhibiting star-like reflected or refracted light when cut as a cabochon. 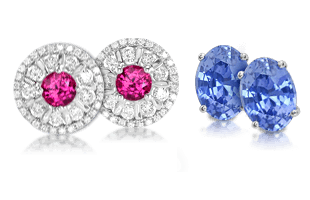 Beryllium diffusion: a process by which sapphires are heated near to melting point, then beryllium is introduced to diffuse deeply and evenly into the stone, creating the appearance of strong color in a poorly colored stone. Used to introduce orange and golden hues. Bi-color sapphire: sapphire gemstones that contain two colors as a result of color zoning. Brilliance: the amount of light that a cut gemstone reflects back to the viewer from the interior of the stone. 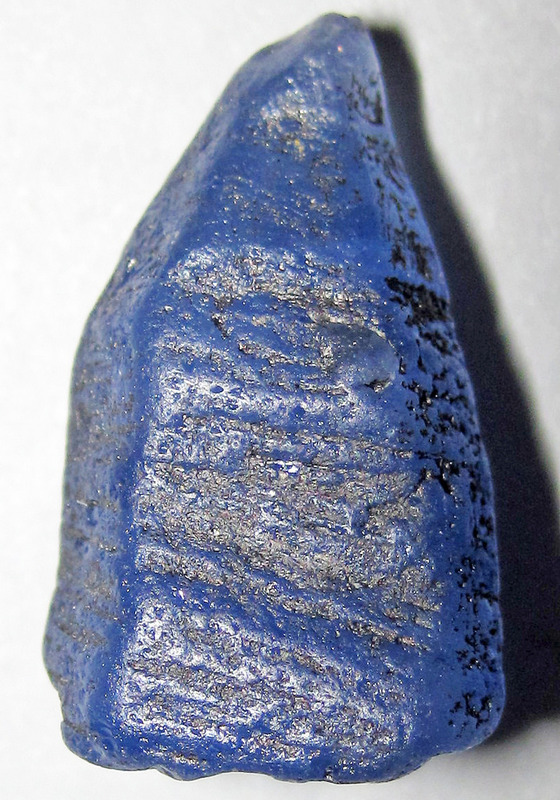 A blue sapphire sugarloaf cabochon. Cabochon: a gemstone that has been shaped and polished as opposed to faceted. Cavity: voids or holes that extend from the surface of a gemstone into its interior. 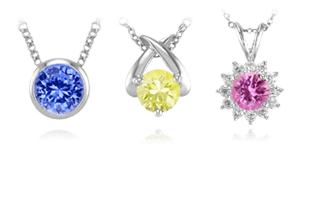 Color zoning: areas or bands of alternating color in a gemstone. Commercial quality: a term used to describe the vast majority of gemstones available on the market, the characteristics being that they are lower quality in color and clarity, and are cut to conform to standard calibrated sizes. Concaves: natural indentations in the surface of a gemstone created during crystal formation. Cornflower blue sapphire crystal rough. Cornflower blue: the color of sapphire that is said to be closest to a true blue, without any undertones of purple or green. 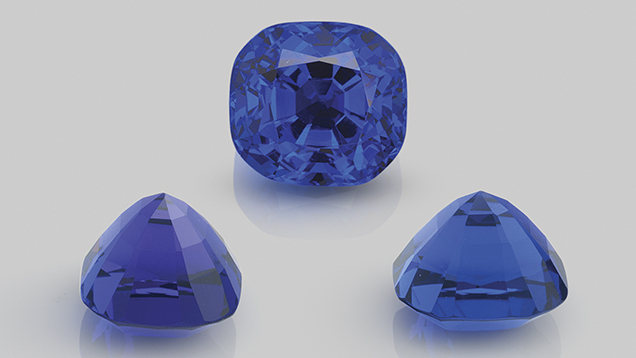 Sapphires of this color are often the most prized by connoisseurs, and gems from Sri Lanka and Kashmir are typically described as having this color. Corundum: a crystalline form of aluminum oxide. It is naturally transparent, but will have different colors when certain elements are present. Crown: the upper portion of a gemstone that begins just above the girdle. Crystal structure: the ordered arrangement of atoms, ions, or molecules in a crystalline form. 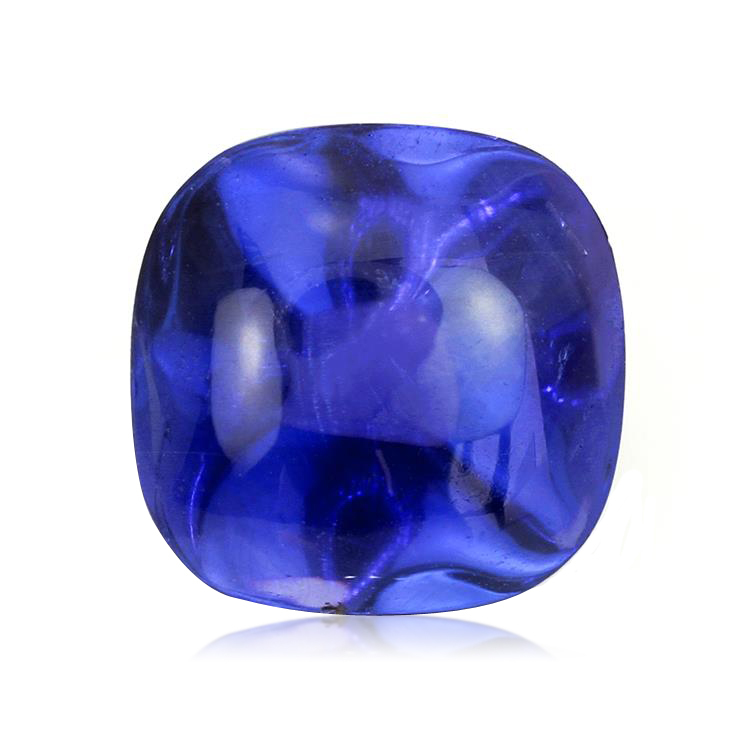 Curiosities: this describes a certain classification of sapphires that are too unique to be placed into one color category. Dichroism: the effect of visible light being split into distinct beams of different colors. Eye-clean: the term for the best clarity grade for a sapphire, which means no inclusions are visible to the naked eye. Facets: flat faces on geometric shapes. Gemstones have facets cut into them to improve their appearance by reflecting light. 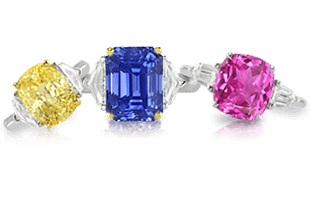 Fancy sapphires: the term applied to colors of sapphire other than blue. Feathers: small inclusions in the surface of a gemstone created during crystal formation. Fingerprint inclusions: networks of tiny liquid-filled tubes that resemble human fingerprints. Finish: the precision with which facets meet, the relative size and number of facets, and the quality of the stone’s polish. Flux healing: a process involving heating a gemstone and infusing a chemical flux that once it cools, has facilitated corundum recrystallization within the fissure, filling fractures or cavities to improve clarity, luster, and durability. 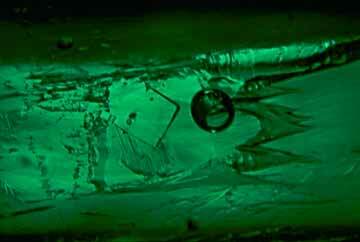 Fracture: cracking or breaking in the crystal formation of a gemstone, often surrounding inclusions. 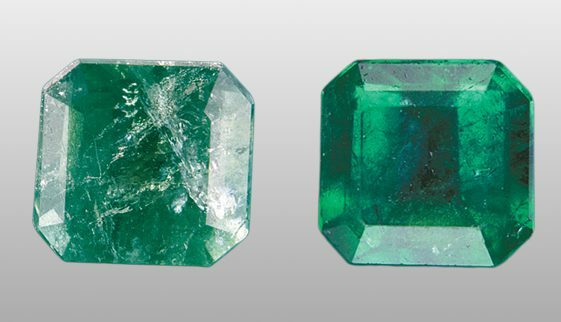 A before and after image showing fracture filling in an emerald. 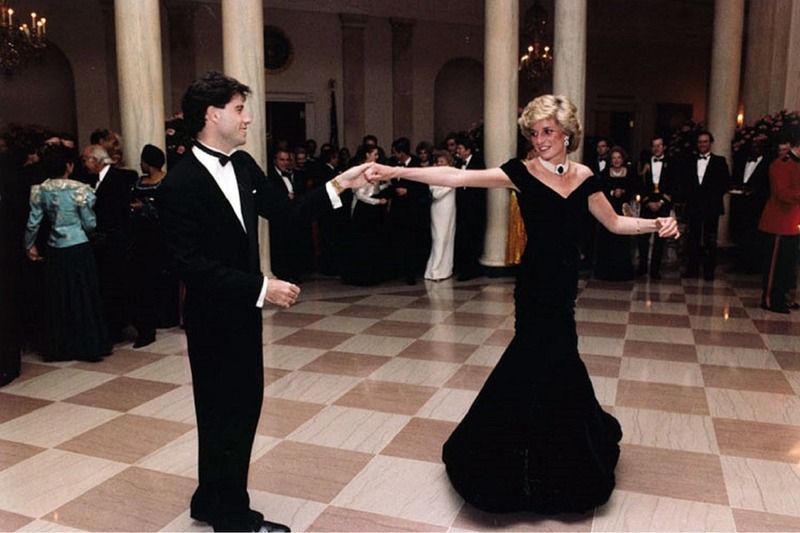 Photo credit: gia.edu. Fracture filling: a process involving heating a gemstone and infusing a chemical flux that once it cools, has solidifies into a glassy mass, filling fractures or cavities to improve clarity, luster, and durability. Gem quality: used to describe a gemstone of extremely fine and rare quality. Gemology: the science dealing with natural and artificial gemstones. A branch of mineralogy, some jewelers are trained gemologists while other are only qualified to evaluate gems. Gemstones: a piece of mineral or crystal, which in a cut and polished form, can be used to make jewelry and other decorative adornments. The side view diagram of a gemstone showing the placement of the girdle. 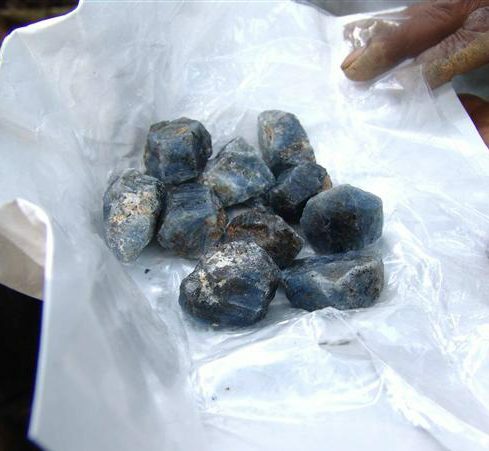 Geuda: a form of the mineral corundum found primarily in Sri Lanka. About 70-80% of the stones mined in Sri Lanka are geuda and they carry rutile inclusions that make them milky in appearance, but can be treated to create fairly pretty gemstones. 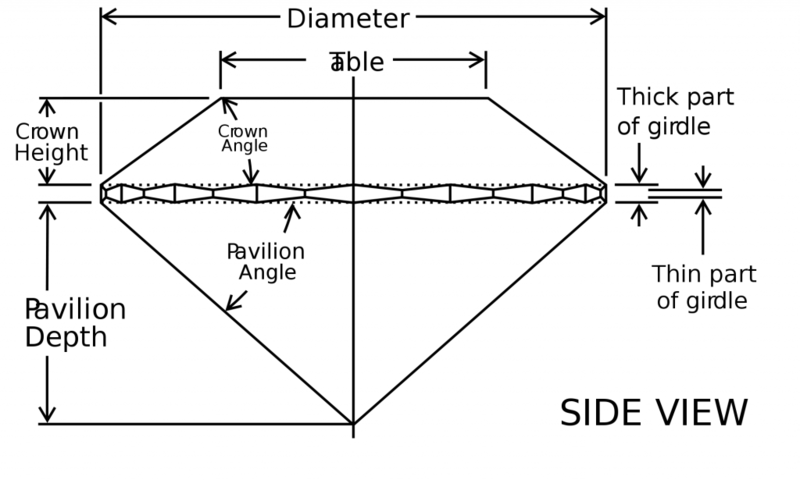 Girdle: the widest point of the circumference of a gemstone; it is the perimeter of the stone that separates the gem’s pavilion from its crown. Hardness: in the case of gemstones, a measure of resistance to abrasion from another source. Heat treatment: the process of heating gemstones to improve color, remove color zoning, and improve clarity. Hue: one of the main properties of a color defined as similar to or different from classified color stimuli. Four corundum samples of the same hue (red), but variations in saturation and tone. Igneous rock: one of the three main rock types that is formed through the cooling and solidification of magma or lava. Inclusion: any material that is trapped inside a mineral during its formation. Within a gemstone, it would be enclosed or reach the surface. Irradiation: a process by which gemstones are exposed to controlled radiation to induce a saturated golden yellow to orange-yellow coloring. Lapidary: a cutter, polisher, or engraver of precious stones, usually other than diamonds. 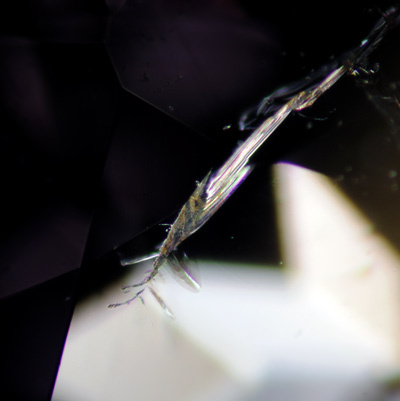 Liquid inclusions: liquid-filled spaces within a gemstone. Luster: the way that light interacts with the surface of a crystal or mineral, and generally implies levels of radiance or brilliance. Metamorphic rock: rock that arises from the transformation of existing rock types once the original rock type is subjected to heat and pressure, causing profound physical or chemical change. Mining: the extraction of valuable minerals from the earth. Mounting: a premade casting awaiting the stones to be selected for the final setting where there are normally preset side stones – usually pave diamonds or side stones. Our 69 carat, natural, untreated blue sapphire. Natural sapphire: a sapphire crystal that has been developed in the earth, not synthetically created or treated in a lab. Opaque: the quality of not allowing the transmission of light through a gemstone. Overall cut grade: an assessment of a gemstone’s cut based on its symmetry, windowing, extinction, brilliance, face-up cut grade, and profile cut grade. Parure: a set of jewelry that consists of at least three matching pieces, usually a necklace, earrings, and a brooch, then often also including a bracelet and tiara or diadem. Pavilion: the lower portion of a gemstone that begins just below the girdle. Pleochroic: the effect of displaying a lighter and more intense color when viewed from different angles. An example of pleochroism in a faceted gemstone. Polish: the finishing process of cutting a gemstone that makes the surface smooth and shiny. Proportion: the rough dimensions and overall symmetry of a gemstone. A selection of natural sapphire crystal rough. Rough crystal: the term given to the uncut and unpolished sapphire stone in its natural state as it comes out of the ground. Royal blue: this describes a very sought after and appealing color of blue sapphires, a deep, rich and “velvety” hue that has been prized by royalty for centuries, contributing to the moniker it carries. Ruby: a pink to blood-red colored gemstone of the corundum mineral variety. Saturation: an attribute of perceived color based on the colorfulness of an area judged in comparison to its brightness. Setting: the element of jewelry in which the gemstone or stones are placed and secured. Silk inclusions in an untreated sapphire. 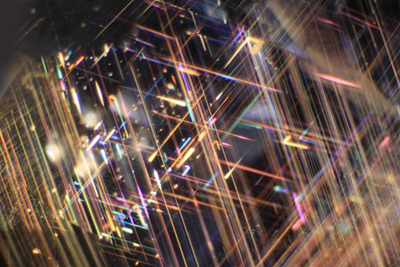 Silk: fine, rutile needle-like inclusions that appear in groups and look like striations in the gemstone. Often referred to as needles. Synthetic: in gemology, this term refers to a stone that has been lab created. Table: this term is used to describe the flat top of the crown of a gemstone. Titanium diffusion: a process by which sapphires are heated near to melting point then titanium is introduced to diffuse into the stone, creating a layer of strong color near the surface of a poorly colored stone. Used to enhance pale blue sapphire stones. Tone: a representation of the variation in the perception of a color and its brightness. Excess amounts of the trace mineral vanadium will create a color change sapphire. Trace mineral: the mineral element present in a sapphire that provides the basis for its color. Translucent: the effect of a gemstone allowing transmitted light to pass through, but objects cannot clearly be seen on the other end. Transparency: the effect of a gemstone allowing transmitted light to clearly pass through so that objects can be seen clearly on the other end. 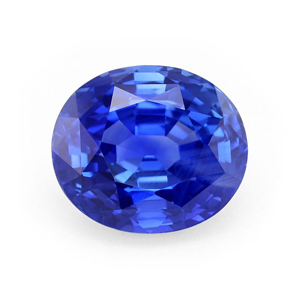 Untreated sapphire: a sapphire that has not undergone any heat or chemical treatments to improve its color or clarity.